The ancient Babylonians made promises to their gods at the start of each year that they would return borrowed objects and pay their debts. The Romans began each year by making promises to the god Janus, for whom the month of January is named. In the Medieval era, the knights took the "peacock vow" at the end of the Christmas season each year to re-affirm their commitment to chivalry. At watchnight services, many Christians prepare for the year ahead by praying and making these resolutions. Interesting beginnings to the practice of making resolutions. Don't really have any resolutions for next year. I really don't make resolutions either. Not that I am perfect and don't need to change. I know I will start out with all good intentions but will fizzle out along the way. I like your attitude of praying and taking one day at a time. That's all I can handle anyway. And yes I will continue to blog until I get tired of doing it. Happy New Year Bob and to your lovely wife too. I can relate to blogging until I get tired of it. I took a cyber sabbatical last year during Lent. PS I ADORE CALVIN AND HOBBES. Love those prayer cards Wanda! 2015 was a rough year for us health-wise. Would love to be in your prayers in 2016. 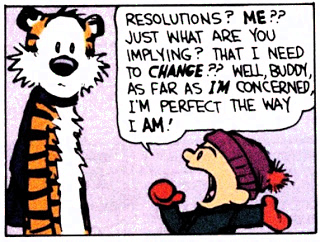 I haven't made any resolutions. Like you, one day at a time is perfect! I love the cartoon. I can so relate. Well, not really. I liked it too Beverly. Happy 2016.